This is an early example of a painted enamel which would once have been the wing of a folding altarpiece (probably a diptych or triptych). The plaque depicts a bishop or mitred abbot, possibly a member of the Aubusson family of the area around Limoges, and it is a companion piece to 4887-1901. The inscription is written in a mixture of capital letters and Gothic miniscule lettering which indicates a transitional style and date of about 1500 for this enamel. This plaque is and important reference piece for Limoges enamelling history as it straddles the period between late medieval and early Renaissance. This is one of about fifty known extant pieces attributed to the hand of an early master in the technique of painted enamels or in the cae of this plaque, to his circle. He was active between about 1480-1500 and may well have also practised manuscript illumination. Although his identity is unknown, this artist is now commonly referred to as the 'Monvaerni' Master. His enamel designs, many of which show scenes from the Nativity and Passion of Christ, rely heavily on 1460s woodcuts by German Masters such as 'Master E.S.' These woodcuts were published in books printed in Lyons in 1482-84. There are also similarities to French and Flemish panel paintings and illuminated manuscripts as is the case with this plaque and its companion, 4887-1901. Limoges, central France, was famous for the production of champleve enamels from the late 12th century until the town was destroyed by the Black Prince in 1371. The enamel industry began to revive about a century later but the technique of painted enamels produced from 1460s/70s was quite different from the earlier medieval work. The copper, probably from Spanish mines, was first of all hammered to thin sheets which were then worked on by the skillful enamellers. It was a long and careful process, with several firings to achieve the finished result. One of two rectangular enamelled copper plaques from a with a diptych or triptych. This would presumably have been the right-hand plaque as the donor faces inwards towards the other plaque or plaques. It shows a bishop or mitred abbot as donor kneeling before his patron saint, St. Peter. The saint touches the donor on his shoulder with his left hand while holding in his right hand his identifying symbol, the keys to the kingdom of heaven. He has a halo and wears a green robe and blue cloak. The bishop kneels before an open book at a prie-Dieu with his hands together in prayer. He wears an alb or surplice beneath a purple cope with jewelled orfreys, morse and mitre rendered by the use of foil-backed translucent enamel drops. By his side rests a shield bearing his coat-of-arms (or, a cross moliné gules, in chief a label of three points argent). It has been posited that these arms may indicate a member of the Aubusson family of the Creuse département (formerly La Marche) which lies in northern part of the Limousin region. The figures are positioned on a green tiled floor and between two columns within a small room with vaults in a Gothic architectural style. Behind them the outline of windows can be seen and blue drapery hangs below a band of foil-backed translucent enamel drops. There is some gilded detail on the architecture and drapery. Below the whole scene runs an inscription in capital letters on a blue band: 'o BONE ihs o DULCY[ssi]me ihs o PIE' (O good Jesus O sweetest Jesus O pious). The marriage of capitals with Gothic miniscule lettering indicates a transitional style indicating a date for the enamel of ca.1500. This is therefore a pivotal piece for the history of enamelling in Limoges as it stands between the late medieval and early Renaissance periods. The counter-enamel is a granular reddish-brown colour, almost transparent in places. O good Jesus O sweetest Jesus O pious. Historical significance: This is one of about fifty known extant pieces attributed to an early master in the technique of painted enamels and in this case, to his circle rather than to the artist himself. He was active between about 1480-1500 and may well have also practised manuscript illumination. Although his identity is unknown, this artist is now commonly referred to as the 'Monvaerni' Master. His enamel designs, many of which show scenes from the Nativity and Passion of Christ, rely heavily on 1460s woodcuts by German Masters such as 'Master E.S.' These woodcuts were published in books printed in Lyons in 1482-84. There are also similarities to French and Flemish panel paintings and illuminated manuscripts as is the case with this plaque and its companion, 4887-1901. 'Monvaerni' first appeared in 1843 in a catalogue issued by the amateur Lyons collector M. Didier Petit. He owned a triptych which now belongs to the Taft Museum, Cincinnati (inv.no.1931.268). The central Crucifixion scene is flanked by St. James and St. Catherine of Alexandria on the two wings. Inscribed along the blade of the sword held by St. Catherine are the words: 'AVE MARI(A)' and 'MONVAE3NI'. The '3' has been read variously as an 'R', a 'P' or a symbol indicating abbreviation. Didier Petit read it as an 'R' and assumed it was a signature - an assumption which gained credence even though there is no documentary evidence to back up such a notion. In 1865, A. Darcel revealed a variant, 'MONVAE' on a plaque in the collection of M. Eugène Tondu. The Louvre acquired a set of twelve plaques from an altarpiece (inv.nos.OA6309-6309l) by the same artist in 1909 and the following year, H.P. Mitchell revealed that the mysterious inscription was not a signature but the name of a bishop depicted on an Adoration plaque (again by the same artist) in the Limoges Museum (inv.no.23). The bishop was Jean Barton de Montbas, Bishop of Limoges and Archbishop of Nazareth. Mitchell proposed that the '3' in 'MONVAE3NI' was an abbreviation symbol and the inscription in full would read: 'MONVA EPISCOPUS NAZARETHI'. In 1914, Haute-Vienne archivist, Alfred Leroux, suggested 'MONVMENTVM ARCHIEPISCOPI NAZARENI'. Henry Martin in 1917 suggested 'MONVAERHL' was an anagram of 'M. NOVALHER', a possible artist from a well-known Limoges enamelling dynasty, but this theory has since been discounted. Verdier (1967) drew attention to 'MONVAE' on a stone in the foreground of a Pietà on the central part of a triptych formerly in the Germeau Collection (Paris) and now in the Czartoryski Museum (Krakow) - probably the above-mentioned Tondu panel reworked into a triptych. Some of the floor tiles visible in the 'Christ before Pontius Pilate' plaque in the Baltimore Museum bear an 'MV' monogram. Verdier (1995) also pointed out the 'consonantal ambivalence' of 'V' and 'B' in relation to Monva/Monbas which he said endured in modern Spanish pronunciation. An Adoration plaque in the Musée Municipal de l'Evêché, Limoges, shows Jean Barton de Montbas, Bishop of Limoges (1484-1510) kneeling at a prie-dieu at the feet of St. John the Evangelist. Barton's coat-of-arms lean against the prie-dieu. They are also to be seen on a keystone in the choir at the collegiate church of Eymoutiers, about 45km. from Limoges. This bishop is known as Jean II Barton to distinguish him from his uncle Jean I Barton, his predecessor as Bishop of Limoges (1458-84) who resigned from that position to become Archbishop 'in partibus' of Nazareth (an honorific title). Jean I Barton died on 3rd May 1497 and was buried in the choir of Limoges Cathedral. It is Jean I Barton who is depicted on the V&A's Pieta plaque museum number 4868-1901, presented by his patron saint, John the Baptist. His crozier is in the form of a double cross or cross of Jerusalem. This refers not only to St. Martial, first Bishop of Limoges, but also to the archbishopric of Nazareth and to the Holy Land, from where came relics of the True Cross. Both the V&A and Limoges plaques can therefore be dated to 1484-97. Their arched tops and similar size suggest that when the Jean II plaque was made it was deliberately matched to the existing Jean I plaque. It may well have been Jean I Barton who commissioned the Taft triptych, possibly as a votive offering, especially as the MONVAERNI inscription is in the genitive case. Jean I Barton is also depicted on a (now restored) stained glass window of about 1475 in Eymoutiers church, in conjunction with his patron saint. 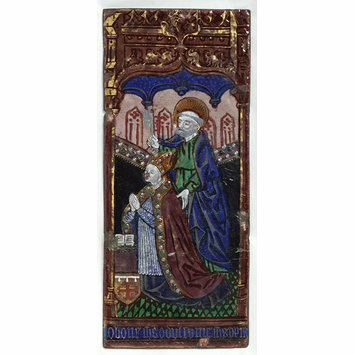 Rectangular copper plaque painted in polychrome enamels with gilded detail and foil-backed translucent enamel drops with a donor and St. Peter. Circle of the so-called 'Monvaerni' Master, Limoges, France, about 1500.